MCx code has brought many new features including the revolutionary ‘Multicore Raid’ which includes the ‘Drive Mobility’ feature. Drive Mobility (also referred to as Portable Drives) allows for the physical relocation of drives within the same VNXe, this provides the flexibility to relocate a drive to another slot within the same DAE or to another DAE either on the same BUS or to another BUS. 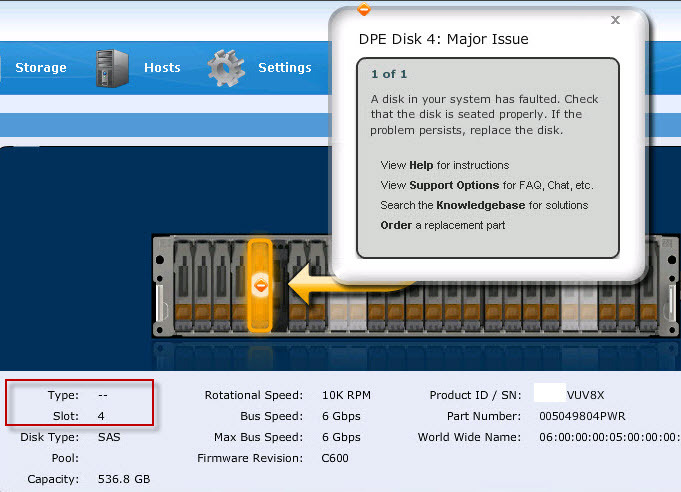 This option allows us to modify the storage layout of a VNXe which may be very useful for example if additional DAEs are purchased and/or for performance reasons a re-balance of certain drives across DAEs or to a different BUS is required. Another reason as outlined in the related post highlighted above is when a drive failure occurs and you wish to move the spared drive to the failed drive slot location once the rebuild has completed. The Drive relocation can be executed online without any impact, provided the Drive is relocated within the 5 minute window allowed before the VNXe flags the missing drive as a failure and invokes a spare drive. No other drive within the RAID N+1 configuration can be moved at the same time, moving another drive at the same time if exceeding the RAID N+1 configuration, for example moving more than 1 drive at a time in a RAID-5 configuration may result in a Data Unavailable(DU) situation and/or data corruption. Once the drive is physically removed from its slot then a 5 minute timer kicks in, if the drive is not successfully relocated to another slot within the system by the end of this 5 minute window then a spare drive is invoked to permanently replace the pulled drive. During the physical relocation process of a single drive within a pool the health status of the pool shall display ‘degraded’ until such time as the drive has been successfully relocated to another slot at which time the pool shall return to a healthy state with no permanent sparing or data loss occurring due to the fact that a single drive in a RAID N+1 configuration was moved within the 5 minute relocation window allocated. At this stage a second drive from within the same pool can be moved, continuing this process until you achieve the desired drive layout. You may wonder how this Drive Mobility is possible: With MCx when a Raid Group is created the drives within the Raid Group get recorded using the drives serial numbers rather than using the drives physical B_E_D location which was the FLARE approach. This new MCx approach of using the drives serial number is known as VD (Virtual Drive) and allows the drive to be moved to any slot within the VNXe as the drive is not mapped to a specific physical location but instead is recorded based on the drives serial number. For this example the drive located in SLOT-5 of the DPE will be physically removed and placed in SLOT-4 on the same DPE. At this stage it is safe to proceed with the next move!